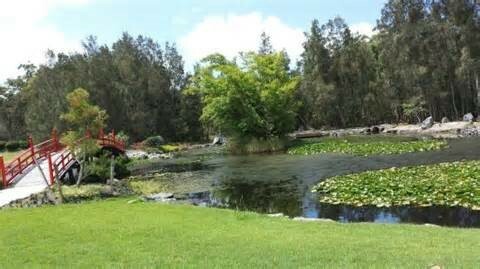 The North Coast Regional Botanic Garden is one of the major regional botanic gardens on coastal New South Wales north of Sydney. It covers 20 hectares of Crown Land and is bounded on three sides by the Coffs Creek, a wide mangrove-lined, tidal estuary. The Garden was designed to feature natural forest, rare and endangered Australian species and exotic plants from other sub-tropical regions of the world. Officially opened in 1988, the Garden continues to expand, with the newest addition being a Japanese Garden featuring a lake, arched bridge and tea-house. With five kilometres of well-made paths and boardwalks for visitors to explore and a glasshouse complex comprising of five interconnected pods for plants that require special growing conditions such as bromeliads, ferns, orchids, gingers and arid-land species, there is an abundance of plants for visitors to see. There are an outstanding number of local folk who give generously of their time, expertise AND sweat to provide the Coffs community with something to be justifiably so proud of and also fulfils the 'Friends' aim to develop and promote the Garden for the enjoyment and education of the Coffs community. This Botanic Garden is testament to the power of the volunteer! The Garden is located on the corner of Hardacre and Coff Streets, about 1km east of the Coffs Harbour central business district, where the CHGC hold their monthly meeting on the third Saturday of the month (Feb-Nov) at 1:30pm. Click For more information about the gardens. After the tour we will be having lunch at the Botanic Garden. If you require any further information please email Jane.